Assistance dogs come in all shapes and sizes! Some are family pets, some are specially trained rescue dogs and some are bred to do the work. One thing they all do though, is become friends and helpers to their human partners, giving those people greater confidence and more independence. 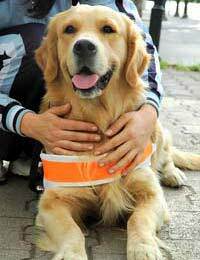 Assistance dogs can be trained to help in numerous everyday situations, by channelling their natural willingness. The dog’s skills are honed and adapted to the individual needs of the owner or client. Puppies are bred and trained to assist the blind/visually impaired client (guide dogs) and for the deaf/hearing impaired. Seizure alert dogs are able to detect their owner’s imminent epileptic seizures, and hence warn them to get to safety. These dogs stay with the person, during the fit, to protect them and assist them when the fit is over. Accompany their owners shopping and so on. This list gives only a few of the tasks assistance dogs are capable of being trained to perform. All assistance dogs must be properly socialised. Basic obedience training, by way of control exercises, is another of the early stages in training. For dogs who progress satisfactorily through the basics, the next, more advanced level, can begin. This includes additional intensive control exercises, like asking the dog to go and pick up an object and bring it back, close the door - by pulling on a piece of rope attached to the door handle - unload the washing machine with its mouth and other, more demanding, commands. At this stage the dog will also need more advanced socialisation to assess its work capabilities when in public places. Dogs are taught to ignore food, even when it’s in the most tempting situation! It is crucial that assistance dogs concentrate on their work and are not distracted by anything outside their area of job focus. Any lapse of concentration, no matter how brief, could be catastrophic for the person who relies on them for support. Dogs are assessed throughout their training. Any concerns about whether the dog can cope with stress, its recovery rate if disturbed by any particular situations or events, or general demeanour will be addressed. Full behavioural and veterinary evaluations are made on all dogs that undergo this specialised training. There are residential training centres designed for the more advanced stages of training. Before they reach this level, dogs will undergo training at home with their owner, under the supervision of a designated trainer, or live and work with an approved ‘puppy walker/trainer’. These animals can usually be identified by the vest or coat they wear with the name of the training centre on it. They often say things like ‘Assistance Dog in Training’ on them and may carry a polite notice requesting that people do not distract them while they’re working. The dogs associate wearing their ‘work clothes’ with tasks. When a dog has reached the final stage of its ‘apprenticeship’ training continues in the home environment where the dog is to be placed. It is just as important that the dog and the person it’s trained to help get on! Other family members and existing assistance dogs that are being retired, for example, need to bond with the new dog for the partnership to fully succeed. Volunteers are the backbone of these schemes. Puppy walkers, dog trainers and permanent foster homes for the dogs that don’t quite make the grade, most are unpaid dedicated people. Breeders often donate puppies that show potential as assistance dogs. Those who are employed to work with assistance dogs - team supervisors, mobility instructors, training managers, placement officers and other areas - are all experienced and mainly qualified. Assistance dogs do more than open doors for people, literally! Hi, I’m a (nearly) 12 year old boy. Unlike most children, for the last 4 years I have been thinking of a future career. I have decided I want to work in the police department with dogs! Any advice?